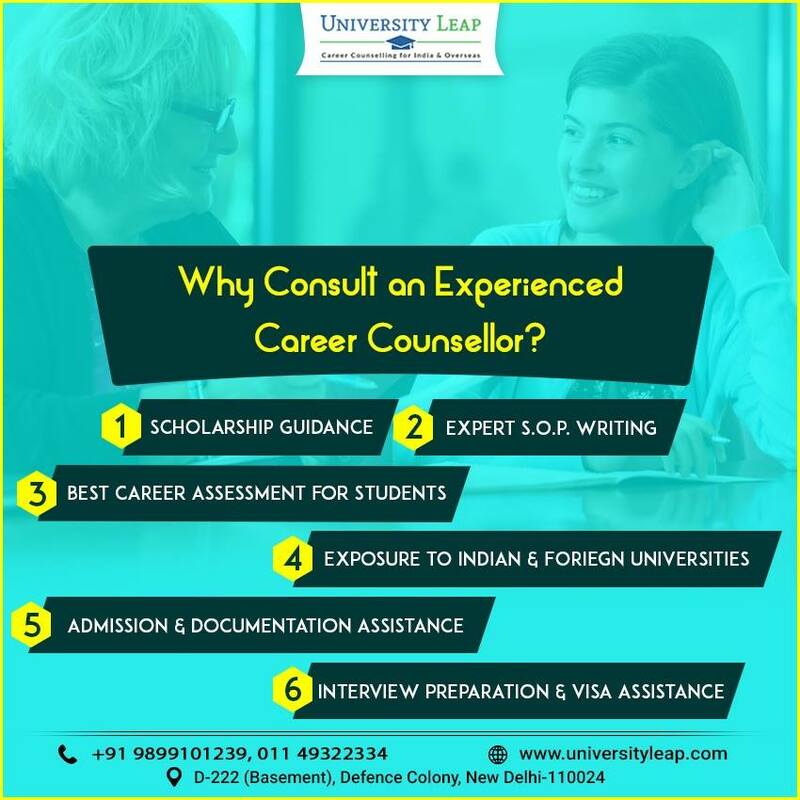 Education > Top Benefits of Consulting an Experienced Career Counsellor for Higher Studies? Amidst the great volume of advise and suggestions given to students for higher studies, the thought of a career counsellor in the picture looks interesting. While some parents would be possessive to push and motivate their children to take up high-demanding courses & subjects, some parents might consider it a better idea to let their children create their own decisions. To not keep things unclear and unresolved between the two (parents & children), expert career counsellors can come in the picture finally! If your child wants to study in India or overseas, the expert study abroad education consultants in Delhi & other metro cities would play a very positive and remarkable role in his/her life. The education consultants hold the experience of studying student psychology intensely, which otherwise the parents and teachers might miss upon. One-to-one Discussion on Career Plans: The best career counsellors patiently deal with students and understand their interests and skills through discussions, as well as through psychometric testing. This examines the mindset, passion and skills of a student. Moreover, it is of utmost importance because a person can be successful, only when one has the right direction to follow. Exposure to Courses & Global Universities: Education consultants give a list of universities to students, where they can study the course of their likeness and interests. These universities include both Indian (home country) as well as prime universities across the globe. This information can be very vital, given its authenticity and updated nature only known to the counsellors (since they are experts at their job). Admission Guidance & Assistance: Once you select a course and college keeping in mind the fee and other expenses, the education counsellors help students in the documentation process, including interview preparation. You might have to give certified language tests in English, etc., as per the requirements of universities. The admission assistance provided acts as a quality fuel for rapid documentation process. Expert S.O.P Writing: As time flows through the board examinations, you would like to concentrate more on your exams rather than on drafting a perfect / proofread ‘Statement of Purpose’ for various universities. The study abroad education consultants in Delhi write a well-drafted S.O.P to get you a go-ahead with the filing of other required documents. Scholarship Guidance: Yes, this is one topic about which most students and their guardians think. Not once, twice but many times. The expert educationists explain students the scholarship criteria formulated by individual universities across the globe. Accordingly, you can explore the exciting opportunities of availing scholarships from the best educational institutions. This helps, always!